Clarke announced yesterday that the company would return most of the excess cash that they have to shareholders using a special dividend of CA$2/share. Clarke has been looking for attractive investment opportunities for some time, and besides buying a basket of energy related stocks they haven’t found anything. So they have decided to do the right thing, and return the money to shareholders. They are returning CA$31.3 million which represents roughly 85% of their cash on hand. At the same time Clarke has decided to eliminate its regular dividend of CA$0.10 per quarter which makes sense since they don’t have assets anymore that produce a regular cash flow. I think both are great decisions that shows once again that it is run by a shareholder friendly CEO that understands capital allocation. The market reacted quite favorably on the news and as a result the discount to NAV (proforma for the $2/share dividend) has shrunk to less than 10%. I think this is roughly fair value (maybe still a bit on the cheap side) and because of that I decided to exit my position. A small discount is warranted because of overhead at the company level, and at the same time I expect that in the near term no value will be created anymore by share buybacks since most of the cash will be gone. And buying back shares at such a small discount wouldn’t create a lot of value anyway. This entry was posted in Portfolio and tagged CKI.TO on June 11, 2016 by Alpha Vulture. Today I rebought a position in Clarke Inc. 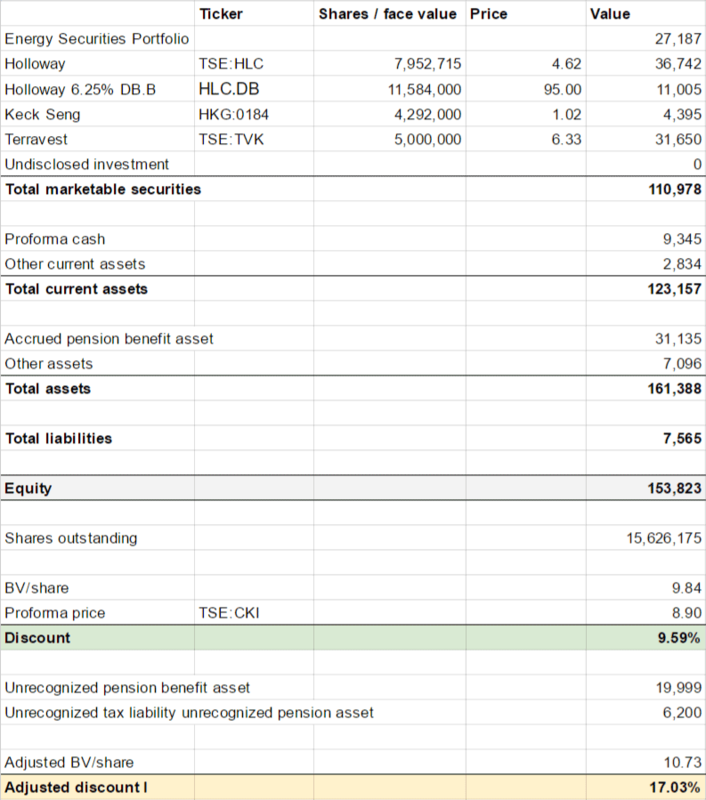 I exited last year when the discount (adjusted for the unrecognized pension asset) was just 14% but since that is now back to 26% I’m also back in the stock. Perhaps the market has some uncertainties about the energy securities portfolio that Clarke owns, but I don’t think that is a good reason for such a big change in the discount since that part of the portfolio is worth just ~10% of the company. What’s also interesting is that Clarke is back repurchasing shares, but they are doing it a bit stealthy. The pension fund acquired 595,900 shares in 2015 which is 3.8% of all outstanding shares. Especially in November and December the fund appeared to have been active in buying stock according to Sedi.ca. Author is long Clarke Inc. This entry was posted in Portfolio and tagged CKI.TO on January 6, 2016 by Alpha Vulture. I sold my position in Clarke yesterday. I needed to create some room in my portfolio, so I looked at my portfolio and asked myself the question: “If I would start from scratch today, what stock wouldn’t I buy”. AIG was actually the obvious answer, but selling that stock wouldn’t solve my problem because I have a lack of margin room in my portfolio while my net exposure is still comfortably below 100% (my target). The main reason for this is a long/short trade where both legs are non-marginable (like most of the stock I own). In this group Clarke was the obvious sell. 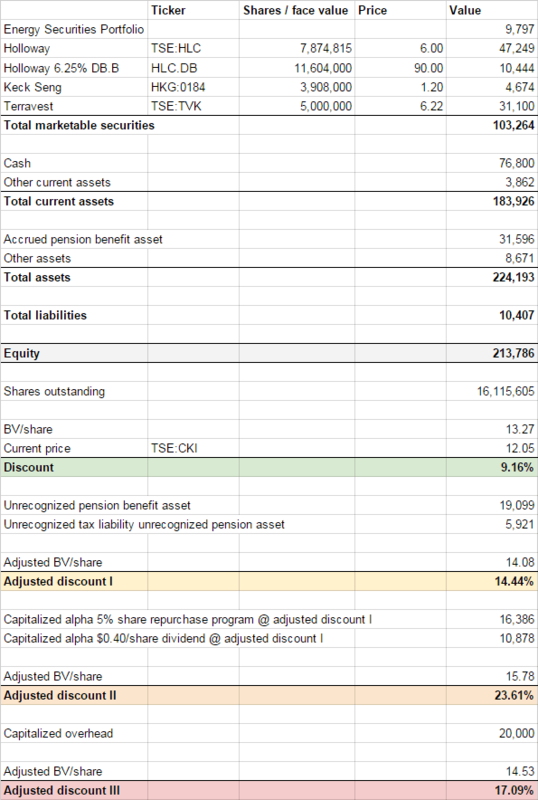 Since I initiated my position in the company the discount between book value (adjusted for the unrecognized pension asset) and the stock price has shrunk from 27.7% to 14.4% thanks to aggressive share repurchases. Because the discount is now a lot smaller future share repurchases will add a lot less value while fixed overhead costs remain. As a result, the stock is in my opinion now trading fairly close to fair value which I estimate at ~CA$13.50/share. Because of the share repurchases and the shrinking discount I made a 22.5% return in roughly six months while the underlying value of Clarke’s assets remained basically unchanged: Holloway is down a couple percent while Terravest is up a little bit. Not a bad result in my book! This entry was posted in Portfolio and tagged CKI.TO on June 24, 2015 by Alpha Vulture. The Offer was an accretive transaction for Clarke as the Shares acquired under the Offer were purchased at a substantial discount to the Company’s book value per Share. Adjusting the Company’s $12.57 book value per share at December 31, 2014 solely for the effects of the Offer and the Company’s previous substantial issuer bid that was completed on January 26, 2015 , Clarke’s pro forma book value per share at December 31, 2014 was $13.06 . This is exactly why I like Clarke as an investment. You can win when the discount to NAV shrinks, or you can win when the company creates value by repurchasing shares at a discount. This entry was posted in Portfolio and tagged CKI.TO on April 8, 2015 by Alpha Vulture. Finally, we continue to view our Common Shares as undervalued. As long as this situation exists, we will continue to repurchase our Common Shares as it is the equivalent of buying a dollar for a fraction of that amount. We repurchased 1,243,846 Common Shares under our normal course issuer bid (“NCIB”) in 2014 and 665,330 shares under our SIB in early 2015, all at a discount to our book value per share. With the stock currently trading at $9.60 Clarke is (again) not offering a big premium to entice shareholders to tender their stock: just 5.2% (taking into account a CA$0.10/share dividend that will be payable in the meantime). If the company will be able to successfully complete the tender offer they will increase NAV/share with ~CA$0.30 which represent an increase of ~2.4%. Doesn’t sound like a lot, but I think that’s a pretty awesome result. This entry was posted in Portfolio and tagged CKI.TO on February 25, 2015 by Alpha Vulture.